If you love truth, be a lover of silence. Silence, like the sunlight, will illuminate you in God. * A “Tenebrae Service” is truly a wonderful service that would help us to have a more reflective observance of the holy week. I suggest that if you’ve never been to a Tenebrae Service that you come and experience it! This might be a tradition we can start here in our parish as part of our yearly holy week liturgy. Tenebrae service is as old as the liturgy of the Church. For centuries, the Church holds this tradition with esteem. It takes place in one of the last three days of holy week, mostly as part of the "Triduum." The word Tenebrae is Latin for “shadows” or “darkness," oftentimes translated as “night” or “death.” The main purpose of this service was to remember the events of Jesus' last week from the triumphant entrance into Jerusalem on Palm Sunday through the quiet night of Jesus’ burial on Good Friday. During the service the flames of the seven candles are extinguished one by one accompanied by the reading of the Scriptures and music, surrounding the stories of Christ's passion and death. This gradual descent into gloom symbolizes the last few days of Jesus as He is going through agony and pain, the seven last words. To represent the closing of Christ's tomb, a significant loud noise may be sounded. Then out from the hidden view of everyone, a lit candle is made visible to represent Christ's resurrection. From here, the service ends and everyone walks out quietly as the spirit of the service accompanies our contemplative observance of the holy week with deep prayer and gratitude to the mercy and love of God. Note that there is NO Easter Sunday Mass at St. Mark's. Thank you to all who have already given to the 2019 Care and Share Annual Catholic Appeal. Your support not only helps our diocese, but also helps our parishes meet our 2019 appeal goals. If you have not yet had the opportunity to make your pledge or gift, envelopes are still available and can be found in the foyer. You may return your pledge or gift in the offertory or simply drop it in the mail. Our parish will receive full credit for your gift. Be assured that your gift will benefit parishes and Catholics throughout our entire diocese. Thank you for your generosity! The Bible Study Group at Holy Trinity Parish now begins with a new module; this is an engaging Journey through the Bible open to all who wish to attend. This eight-part study provides the easiest way to understand the Bible. Unlocking the Mystery of the Bible makes the complex simple. It helps you uncover the story woven throughout Scripture so that you can get the “big picture” of the Bible and understand what it is all about. The Bible is a story about the Father’s unfailing love for you - a love that you are now called to share with others. See how the sacraments, the Church and our entire Catholic Faith is rooted in Scripture, and much more! 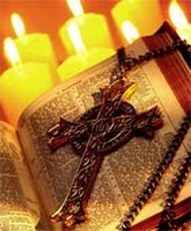 The Bible Study Group meets Sundays at 12:30, after 11:00 a.m. Mass at Holy Trinity. Class will resume on Sunday, April 28. Do not lose your inner peace for anything whatsoever, not even if your whole world seems upset. If you find that you have wandered away from the shelter of God, lead your heart back to Him quietly and simply". We are in need of Mass intentions. Your $10.00 suggested donation contributes to your own parish, and is a good way to honor the memory of those whom we love. Our diocese is asking us to pray the prayer to St. Michael the Archangel after all Masses. All Catholics are invited to join in Friday prayer, fasting and abstinence or some other form of penance. All parishes are asked to pray the rosary for the healing of the Diocese and the Church universal. All households are asked to pray the rosary daily as families for the healing of the Church. All families are asked to share at least one weekly meal as a family at which the importance of mercy and healing is discussed. Prayer cards and discussion questions will be provided. All parishes are asked to provide an opportunity for adoration of the Blessed Sacrament. The Prayer to St. Michael the Archangel is encouraged before or after Mass. The close of the Year of Prayer, Penance, and Reparation will be on November 25, 2019, the Solemnity of Our Lord Jesus Christ, King of the Universe. The bishop will celebrate a Mass at St. Ann's Cathedral, Great Falls. This link provides very good tools for studying the bible. Of the various translations listed, the Catholic Church approves the NAS translation, New American Standard.